Gary, Indiana is a dying city. Its population has halved itself in 40 years, many of its buildings are burned husks, its citizens are disenfranchised and out of work, and even its predators have fled. Of the many Kindred who once hunted this small Midwestern city, only a handful remains. Modius, the Prince of Gary, continues his long rivalry with the Anarch known as Juggler. But their struggles are becoming increasingly irrelevant. If things continue, Gary won't have enough mortals to sustain even a small number of vampires. The Kindred aren't willing to let the city crumble just yet, though. Juggler and Modius have hit upon a scheme to revitalize the city's importance for Kindred, though each wishes to claim the credit (and the rewards) for this renewal. While they snipe and strike at one another like two starving wolves fighting for the last scrap of meat on the carcass, the Giovanni Maria DiMatto seizes her chance. 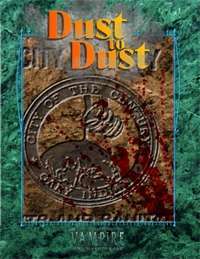 Dust to Dust is a story supplement using the Storytelling Adventure System designed for use with Vampire: The Masquerade -- 20th Anniversary Edition, and it acts as a spiritual successor to the classic story Ashes to Ashes. It includes all the characters and information you need to tell a complete story, as well as notes from the Wrecking Crew, the demo team that ran the story at The Grand Masquerade 2011 in New Orleans.